This compound exercise can be preformed standing or seating. Grip the bar a little more than shoulder width apart. You can take the bar off a rack or lift it from off the ground. Press the bar until your arms are extended over head. Lower the bar in front of your neck. Then repeat. This is probably my favorite shoulder exercise. Grip the dumbbell with your palms facing in. 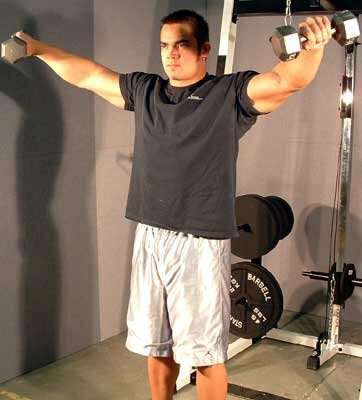 Next, with your arm fully extended down, raise the dumbbell. You do not need to go above your shoulder. I just started adding a twist to this movement. When your arm is almost at the top of the movement, rotate your wrist so your palm is facing the ground. Then rotate back and lower your arm to the starting position. This twist gives you nice definition between your bicep and deltoid. This exercise can be done one arm at a time or simultaneously. Grip the dumbbells just as in the front dumbbell raise. Instead of lifting the dumbbell in front of you, it is raised to the side. Again don't go too far above shoulder level, that could result in strain. I recommend taking light but heavy, if you know what I mean, on this exercise. Going to heavy could result in injury, but that is the same with every exercise. This exercise is best done one arm at a time. 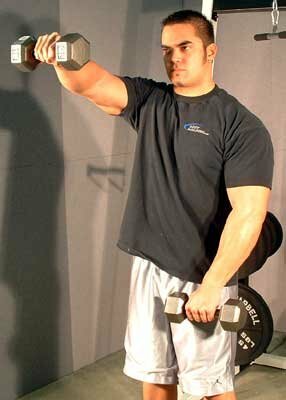 Hold the dumbbell like in the other raise exercises. Bend over slightly. Now you raise the dumbbell backwards and upwards. Be careful not to swing the weight too much. Try this and your delts will be "Dyn-o-mite!"